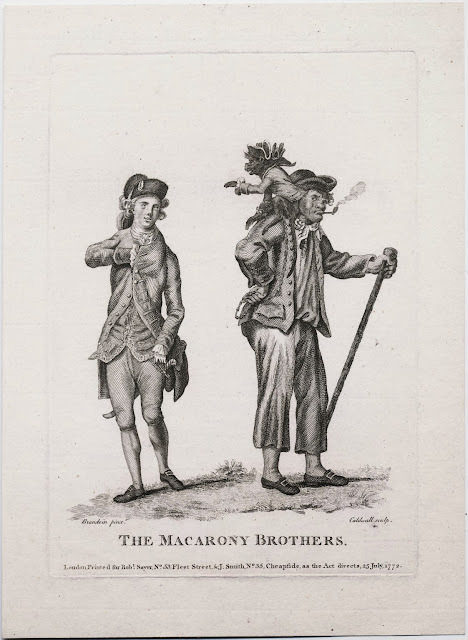 The Macarony Brothers, Michel Vincent Brandoin, 1773, Yale University Lewis Walpole Library. 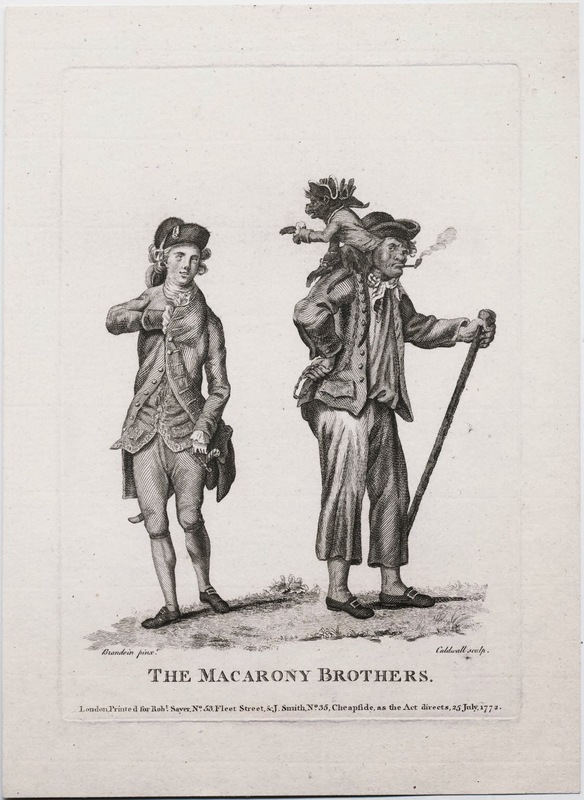 Macaroni (sometimes spelled, as here, "macarony") prints were very popular in the late eighteenth century. These satirical illustrations poked fun at the latest styles and at the men who wore them. I speculate that this print might be reflecting the moral character of the macaroni on the left with the sailor on the right. As "brothers" these two have the same character, though the fop hides it behind his stylish suit and hat. 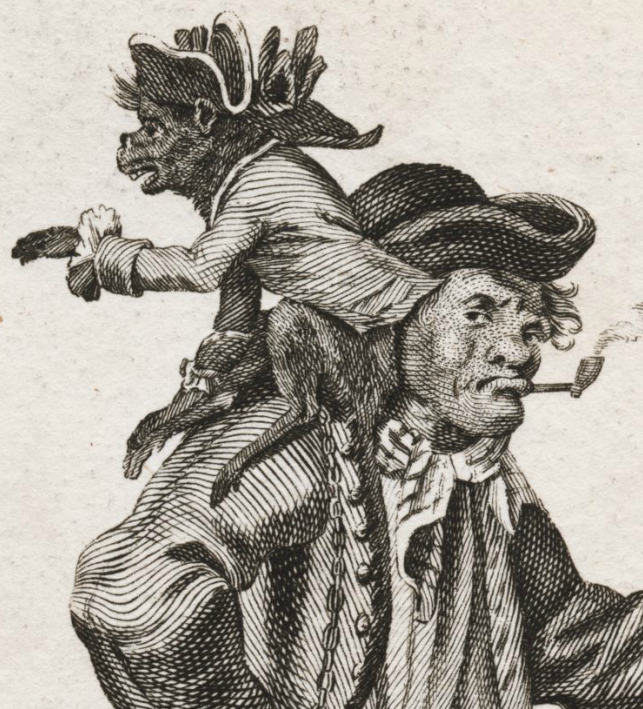 The jack is accompanied by a monkey, who wears a cocked hat trimmed in tape with a large cockade, a coat, and a fancy shirt with frilled cuffs. His owner makes no effort to present himself as well as the monkey or the macaroni. His hat is either a cocked hat with a narrow brim let down, or a round hat with the edges turned up. The neckcloth is striped, and he wears no waistcoat. Our tar's jacket is single breasted with waist pocket flaps and buttons. The buttons appear to be cloth covered. His trousers end about mid-calf, and are plain. Round toe shoes with rectangular buckles complete his slop clothes. 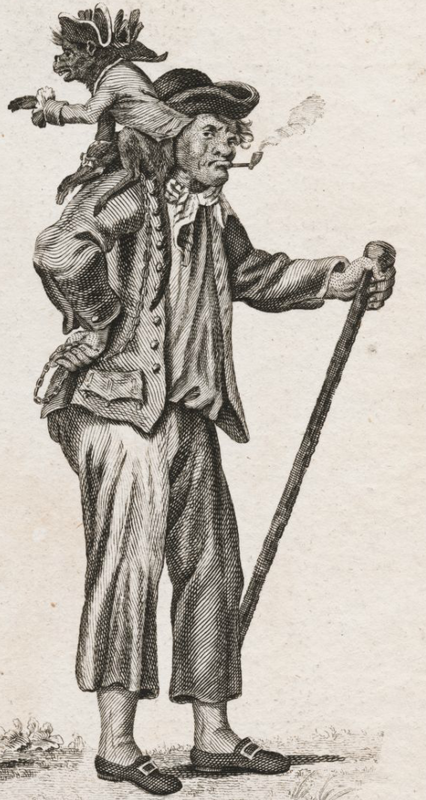 In his left hand is a walking stick, and in his right is the chain to his monkey.